It may be cloudy and in the 60s outside. The calendar says we need to wait another four weeks to declare it. The kids are still in school. Never mind — you can’t go against the feeling. It’s summer when we’ve fired up our Weber gas grill for the first lamb burgers of the season. When I tasted my first lamb burger, in New York City, late night at a diner, I was well into my 30s. My mother never liked lamb so I had never eaten it as a kid. I thought a lamb burger would be an imitation, a second force, not as good as a beef burger. I was shocked. It was far juicier than a beef burger. And the taste was deeply meaty with a tiny hint of sweetness. I stopped ordering beef burgers and switched over to lamb. I still love this grilled lamb with pomegranate and balsamic Danny created a couple of years ago. So, when the Tri-Lamb Board asked to be a sponsor of this site, so we could share our love of lamb? Of course we said yes. Lamb is vastly under-rated in this culture, in our opinion. Did you know that a 3-ounce serving of lamb provides 5 times as much Omega-3 fats as beef? Or that 3 ounces of lamb contains 50% of the protein you need all day? (Nutrition facts courtesy of the Tri-Lamb Board.) Frankly, we just think lamb tastes good and makes a great burger. For the first weekend of summer — a three-day weekend! picnics! gatherings! friends! 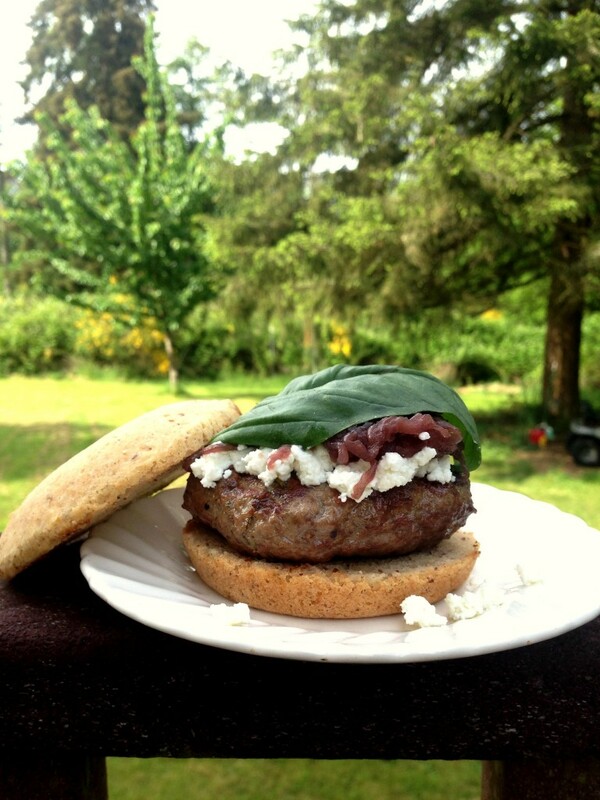 — we made a Provencal lamb burger with red-wine caramelized onions, goat cheese, and basil. And we’ll be making them again. This is a sponsored post but the opinions, language, and recipe are our own. Make the burger. Put the ground lamb in a large bowl. Break up the meat a little. Gently, work the mustard, garlic powder, rosemary, lavender, and salt and pepper into the meat. Do not overmix the meat, which can toughen it up. Fold everything together until it is well combined. Form the burger. Divide the meat into 6-ounce portions. (This will give you 5 6-ounce burgers and one 3-ounce burger, for a kid.) Form each 6 ounce portion into a burger patty. (The Tri-Lamb board sent us this Weber burger press and Danny was hooked. It worked well.) Lay the burger patties on a plate and refrigerate for 30 minutes before grilling. Grill the burgers. Fire up the grill. If you have not already done so, scrape the grill clean. Grease the grill with a touch of olive oil. Brush each side of the burger patties with olive oil, then lay them down on the hot grill. Cook the burgers on the first side until they have charred marks and starting to brown, about 4 minutes, then flip them over. For medium-rare burgers, cook for an additional 4 minutes. Remove them from the grill. Top the burgers with goat cheese, caramelized red onions (see note below), and fresh basil. We liked using a broad basil leaf the way you might use lettuce, but you could also chop up the basil into confetti-like pieces for the top of the burger. Makes 5 to 6 burgers. Note: to make caramelized red onions, do the following. Cut the ends off 3 medium red onions and peel them. Slice them as thinly as you can. (A mandoline works great here.) Set a large pot over low heat. Add 2 tablespoons of olive oil, then the onions. Cook the onions, stirring occasionally, until they have reduced and caramelized, about 45 minutes. Add 2 tablespoons of red wine vinegar and 2 tablespoons of balsamic vinegar. Cook until the vinegars have reduced and turned syrupy, about 10 minutes. Remove from the heat. You can keep these in the refrigerator and use them all week long. Makes 1 cup caramelized onions. Do you have a recipe for the lamb chops with potato purée?